I’m back! Yes, I’m sure you’ve all missed my blogging while I’ve been travelling with the QS World MBA Tour (I’ll just pretend then…) but now that I’m warming up my desk chair, I thought it might be fun to visit some of the fun and strange holiday traditions that you might experience around the world. Krampus, which seems to be the dark-side’s answer to St. Nicolas, is from folklore around the Alpine countries and most commonly referred to in Austria and South Germany. He’s a dark creature that bangs chains around and can be found punishing children who have been naughty, which gives a little trick-or-treat flavor to Christmas. Seem a bit much? Some governments were trying to put a stop to the Krampus traditions but parades can still be found in some regions, you can see some pictures here. Zwarte Piet is another one of St Nicolas’ companions one of the holiday traditions in the Netherlands, though this guy seems to be spreading cheer instead of terror. ZP can be found around the Netherlands passing out sweets and tends to have a following with fancy dress lovers and cultural sensitivity writers alike. The potential of the blackface to be offensive in some western cultures has caused a stir in recent years, but the tradition doesn’t seem to be stopping anytime soon. You can read the Wiki here. 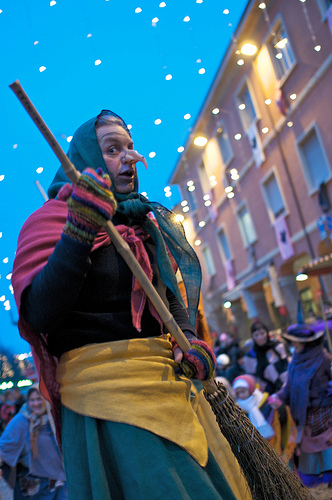 La Befana is a holiday tradition in Rome and most of Italy and is the good witch that comes around in early January on the day of the ephinany to sweep up all the festivities and if you’ve been bad, you might get some sweets that look deceptively like coal… some photos here. Of course there are also much more subtle traditions like putting spiders in Christmas trees (fake ones) in Ukraine, Christmas crackers in the UK, mulled wine, markets, and meal traditions that vary across the world… but who can top closing the streets like they do in Caracas on Christmas eve so people can rollerskate to church?! The moral of the story is that if you’re abroad, you might be in for some eye-opening holiday traditions! Sit back, enjoy, and take some photos to show your family what on earth you’re getting up to, because they might not believe you otherwise. Comment below if you’ve seen any other unusual holiday traditions in your travels! Hi Majeed, please take a look at our list of scholarships for engineering students.